In 1995 a devastating 7.2 earthquake hit Kobe, Japan. In 2002, researchers from Columbia University and the University of Delaware sought out answers to why Segmental Reinforced Soil Retaining Walls, known as SRW, preformed so much better than other retaining wall types in this high seismic event. Columbia University, Allan Block Corporation, Huesker Geosynthetics and the National Science Foundation teamed up to conduct full scale seismic testing on a group of geogrid reinforced soil structures faced with a segmental retaining wall block. The first-ever-full scale testing took place in Tsukuba, Japan in cooperation with Dr. Yoshiyki Mohri at the National Research Institute of Agriculture Engineering. Professor Hoe Ling from Columbia University and Professor Dov Leshchinsky from the University of Delaware headed up the team as the Principle Investigators of the ground breaking research. Most research to this point had focused on the individual components of the structure and performance in static conditions. Much of the research had indicated an overly conservative approach was used by over estimating loads and underestimating the system performance of the geogrid reinforced SRW structures. Yet as is customary in the engineering world, change is not easily achieved. The intent of this study was to not only evaluate and substantiate system performance with dynamic excitations, but illustrates the basic performance characteristics of these systems when used in static environments. The first test wall performed so well under the initial excitation with virtually no visible damage that the magnitude of the load was doubled and still performed extremely well. From that point, all test walls were tested at 0.4g and again at 0.8g, exceeding the measures Kobe Earthquake. Various reinforcement spacings, length and infill soil types were tested providing the researchers with a vast amount of data. To analyze the internal and external performance characteristics of a full-scale geogrid reinforced soil mass with a concrete segmental wall facing when significant earthquake loads are applied to the structure. To determine the ramification of earthquake loading on current design standards and modify the design and reinforcement parameters to ensure a safe and cost effective design solution. To evaluate observed behavior and loads when compared to design calculations. To evaluate the effectiveness of a block to geogrid connection based on rock-lock achieved through a hollow core concrete unit. To determine the performance characteristics of a structure with Fortrac geogrids in combination with Allan Block retaining wall units. To avoid possible scaling problems associated with reduced scale model tests, full-scale walls were constructed using prototype blocks and geogrids. 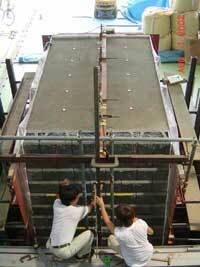 Each test performed showed repeatability in results and incredible tolerance to large seismic loads. The following video is of one of the actual tests. Professor Hoe Ling and Professor Dov Leshchinsky published many papers on the results of these tests and their findings lead to a radical methodology change in SRW seismic designs. The old theoretical based methodology of an inverted force triangle was changes to a rectangular force distribution. The results were so compelling that in only a few short years of the completion of the tests, the National Concrete Masonry Association (NCMA), AASHTO, and the Federal Highway Administration (FHWA) adopted this change in their design of segmental retaining wall manuals. Reinforced soil structures faced with segmental retaining walls have become a cost effective solution for retaining walls in residential, commercial and governmental land development. Over the past twenty five years the use of these types of systems has spurred a historical evolution in retaining wall design and construction. Change is seldom readily embraced within the Civil Engineering community, but the merits of geogrid reinforced soil structures captured the attention of the design and building community. Use of segmental blocks in conjunction with geogrid-reinforced soil has become a significant percentage of the different types of retaining walls. Prior to these tests, most research has been compiled through numerical modeling, from instrumentation of walls and reduced scale laboratory tests in static loading conditions. The intent and result of this venture was to evaluate the true performance characteristics under realistic earthquake loading and to substantiate these systems for both seismic and static conditions. The results were clear and irrefutable.